by Chris Woodford. Last updated: March 30, 2019. When broadband Internet first came along, it seemed like nothing short of magic. Suddenly, we could stay online as long as we wanted without blocking the phone or running up monstrous call charges. Music and movie downloads that had once taken hours or minutes now took minutes or seconds. High-resolution movie streaming became possible, shifting our focus from the cathode-ray tube (television, in other words) to YouTube, and powering IPTV and the Netflix revolution. Broadband, in short, swept us from the dirt tracks to the freeway—and left the 21st-century information age lying at our feet. But how exactly does it get so much more Internet power from exactly the same piece of cable that powers your ordinary telephone line? And what's the difference between landline broadband (on your desktop computer) and the mobile broadband that powers your cellphone? Let's take a closer look! 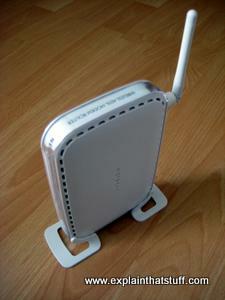 Photo: A typical broadband modem made by Netgear: the piece of equipment that lets your computer make a broadband connection to the Internet. The long white bar sticking out of the back is a wireless antenna (aerial). Most of us go online in two distinctly different ways: with desktop computers (in our homes, offices, and schools) using fixed Internet connections and with mobiles (generally, laptops, tables, and smartphones) using wireless Internet. Desktop computers typically use what's called "fixed-line" broadband that works over old-style landline telephones or cable, while mobiles "roam" between different wireless Internet connections, either hooking up to nearby Wi-Fi hotspots (which are linked to the Internet, like desktop computers, using phone or cable) or falling back on slower cellphone networks when Wi-Fi isn't available. In other words, there are really two different kinds of broadband—fixed and mobile—and we'll consider them one at a time. First, though, let's see how we got where we are today. Before the Internet came along, the world of computing was a very different place. There were far fewer computers and they worked mostly in isolation or in small networks known as LANs (local area networks). The Internet has increased the power of people's computers many times by allowing all these machines to talk to one another and exchange information via such things as e-mail and file sharing. You might wonder where the Internet came from; it seemed to take off virtually overnight. In fact, the vital piece of infrastructure on which the Net is built was already in place and had been invented back in the 1860s. I'm referring, of course, to the telephone system. When computer networks began to take off in the 1970s, it was perfectly natural to use the telephone system to connect them together. But this created an immediate problem: computers exchange information (data) in a number-based form known as digital, whereas the telephone system had always been designed to handle rapidly changing sound waves or analog information. How could computers and telephones be made to understand each other? The answer turned out to be surprisingly simple. If you go on holiday to a foreign country where you can't speak the language, you have two choices. One is to shout, wave your hands around, and point excitedly. A much better option is to get yourself a translator, who can convert your words smoothly and seamlessly back and forth into the foreign language. This second approach is the one that computers use when they want to exchange information over the old-fashioned telephone network. But instead of using a translator, they use an electronic "translating" device called a modem. Photo: A pair of old-style dialup modems. The dark box on the bottom is a typical 56K dialup modem from the 1990s. 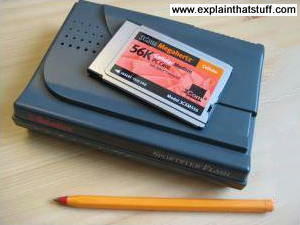 On top is a 56K credit-card-sized PCMCIA modem for use in a laptop. Before broadband took off in the early 2000s, people went online with a system called dial-up Internet, which effectively meant hooking up to your service provider through a very conventional telephone call. When you dialed into the Internet in this way, what you were actually doing was using a modem and telephone line to make a semi-permanent connection into a much larger computer network. As your computer dialed in, it sent digital information down the telephone line to a modem at your Internet service provider (ISP). Once your modem was talking to the ISPs modem, your computer could use the ISP's computer to access other computers all over the Internet. Every time you browsed a web site, your computer made a link to another computer somewhere else on the planet using your ISP's computer as a stepping stone. How is broadband different from dial-up? Dial-up is a really inefficient way of linking to the Internet and hardly anyone uses it anymore. But it helps to know how it works if you really want to understand broadband. When you dial in, your computer telephones your ISP's computer and then hogs the line for the duration of the call (in other words, for as long as you're online). No-one can call you on the phone while you're online. And even though your computer is hogging the entire line, your modem and the ISPs modem exchange information at very low speeds—at best, approximately 56Kbps (roughly 56,000 bits or binary ones and zeros) per second. If you're trying to download MP3 music tracks or digital photos, you'll know this is grindingly slow and tedious. A single music track can take half an hour or more to download. If you try using dial-up Internet these days, you'll find most web pages are so bloated with images, ads, videos, and other widgets that they take minutes at a time to load—if, that is, you can get them to load at all. Broadband works a completely different way. Instead of treating your phone line as a single, narrow pipe between your computer and the ISP's computer, like a dialup connection, it divides the line into many different channels. Information can travel in parallel streams down these channels. It's like dividing a highway into several lanes: lots more traffic can go down it in parallel than down a single-lane road. This is why broadband is so much faster than dialup. Even a slow broadband line, working at 512Kbps, is about nine times faster than the best dialup connection, while a moderately fast broadband line, working at around 8Mbps (megabits per second), can be over 100 times quicker! Artwork: Dialup and broadband use the same phone line, but broadband uses it much more efficiently. Where dialup sends only one voice or data signal down one channel, broadband divides the line into multiple channels, each of which can send data in parallel. Most channels (red) are used for downloading; a few are reserved for uploading (blue). You can also have a phone conversation at the same time (using the green channel). Most people download far more information than they upload (browsing web pages is almost exclusively downloading—because most of the data is flowing into your computer from the Net), so broadband allocates more channels to downloading than to uploading. This is why broadband computers download several times faster than they upload. In other words, downloading and uploading are not equivalent or "symmetrical" processes: they are asymmetric. That's why the technical name for this type of broadband is Asymmetric Digital Subscriber Line or ADSL. Another type of broadband called DSL allows uploading and downloading at (more or less) the same speed. If most people are just downloading, why doesn't broadband Internet scrap the uploading channels altogether and make browsing even faster? Any type of web browsing involves a certain amount of two-way traffic between your computer (which is called a client) and the remote computers (servers) that host the pages you're looking at. Even though most of the data is flowing into your computer, a certain amount still has to flow in the opposite direction each time your computer requests a new page. In other words, even when all you're apparently doing is downloading, there's some uploading going on in the background to make that happen. That just leaves one more question: how can you talk on the phone while your computer is simultaneously sending and receiving data? Simple. Some of the channels on the line are reserved for phone calls. People's voices use relatively low-frequency sounds, compared to the higher-frequency signals that computer modems use, so it's relatively easy to keep the phone signals separate from the computer data. 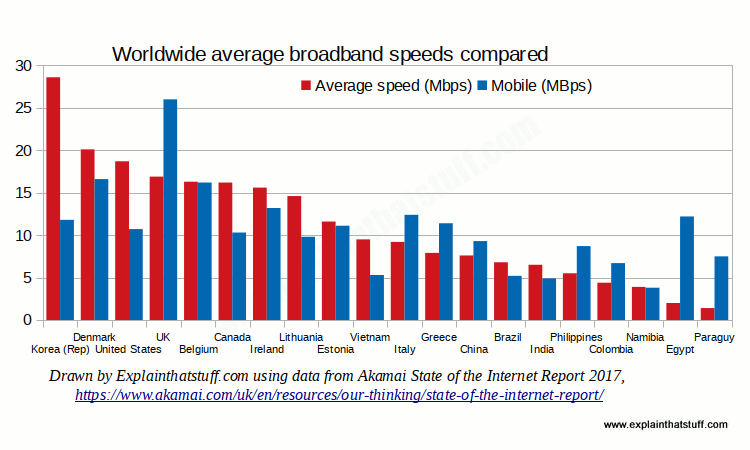 Chart: Broadband speed varies dramatically both within countries and between them. Here (in descending order) are the average connection speeds for 20 representative countries around the world (red), from South Korea to Paraguay. Mobile broadband speeds (blue) are often much faster in countries where landline broadband speeds are slow (such as Egypt, Paraguay, and the Philippines). Source: Drawn using Q1 2017 data from Akamai State of the Internet Report. Telephone lines were never designed to carry computer data. The history of the Internet is, in part, a struggle to shake off obsolete telephone technology. There's obviously a limit to how fast your broadband Internet connection can be if it's still largely based on copper-wire technology dating back to the 19th century. If you're lucky enough to live in an urban area where telephone calls and TV programs flow along fiber-optic cables, you'll probably find cable broadband is the fastest form of Internet you can get—and many times faster than landline broadband. 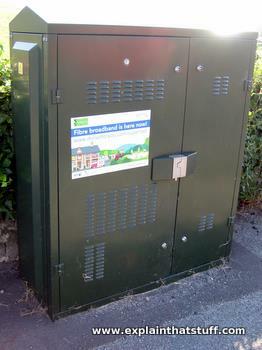 Photo: Fiber To The Cabinet (FTTC) means you get fiber cabling as far as your local curbside telephone cabinet. This is mine. The rest of the distance to your home is handled by more conventional cabling. In many countries, telephone operators are now gradually rolling out what's called fiber-optic broadband, which promises much faster connections than traditional broadband but still essentially over the ordinary public telephone network: "much faster" means download speeds of at least 40Mbps (typically 10–20 times faster) and upload speeds of 1–10Mbps (2–20 times faster). But it's still a compromise. For most people, what they'll actually be using is a system called Fiber To The Cabinet (FTTC) (sometimes called Fiber to the Curb), which means there's a fiber-optic connection all the way from the local exchange to a "cabinet" (switching box) somewhere in your street or neighborhood (usually within 0.5km or so of your home)—but the connection from the cabinet to your home is still (you guessed it) that slow old copper cable! Only if you have a Fiber To The Building (FTTB) or Fiber To The Home (FTTH) connection, with fiber-optic cable running all the way, will you truly experience the benefits of mega-fast Internet. So will we all enjoy fast fiber-optic broadband access in future? Possibly not. Now that cellphone networks can compete effectively with wired telephone networks, it's much more cost-effective to deliver mobile broadband (see below) to people in remote areas than to refit the entire, antiquated, public telephone network; that's why people in developing countries are enjoying growing Internet access through cellphones rather than through ordinary landline telephones (which they never had and probably never will have). As cellphone networks become ever more sophisticated and computers and phones continue to converge, it's likely many people will abandon wired landlines and wired broadband altogether in favor of increasingly sophisticated wireless Internet. Search for that question online and you'll find a plethora of suggestions, ranging from Alexander Graham Bell (developer of the telephone) and Claude Shannon (father of information theory) to Robert Metcalfe (the inventor of Ethernet) and Tim Berners-Lee (pioneer of the World Wide Web). In fact, as with other notable technologies such as cars and computers, it's almost impossible to credit broadband to a single inventor: I'd suggest it was a collective effort. If you trawl through records of inventions at the US Patent and Trademark Office, you'll find a whole series of patents covering simultaneous use of telephone lines for voice and data (the essence of broadband). Among the earliest were patents filed by Teltone's John D. Foulkes and Stephen Brolin et al of Bell Labs. DSL, the concept we'd recognize as broadband today—defined as "the transmission of high-speed digital signals between a telephone central office and the customer premises"—dates from 1986 and was formally patented in 1990 by Richard D. Gitlin et al of AT&T (currently Distinguished University Professor of Electrical Engineering at the University of South Florida). Mobile broadband is a really simple idea and it comes in two different varieties: it's either delivered over a cellphone network or via Wi-Fi from what is, essentially, just a landline or cable broadband link to the Internet. As we've already covered the latter up above, the rest of this article focuses on how cellphone networks deliver mobile broadband. The technical nitty-gritty of how that works gets quite complex; we'll give you a quick and simple overview for starters, followed by a more detailed technical explanation at the end. Photo: Smartphones offer broadband by default on a fast cellphone network—and that's one kind of mobile broadband. But that term can also mean using a desktop or laptop computer over a cellphone network with a plug-in dongle. Cellular phones were largely inspired by landlines (traditional telephones wired to the wall) and worked in a very similar way—until recently. A landline effectively establishes a permanent connection—an unbroken electrical circuit—between your phone and the phone you're calling by switching through various telephone exchanges on the way: this is called circuit switching. Once a landline call is in progress, your line is blocked and you can't use it for anything else. As long as cellphones were using circuit-switching technologies, they could work only at relatively slow speeds. But over the last couple of decades, most service providers have built networks that use packet-switching technologies. These are referred to as third-generation (3G) networks and they offer data speeds similar to low-speed landline broadband (typically 350kbps–2MBps). Over time, engineers have found ways of making packet-switching cellphone networks increasingly efficient. So 3G evolved into HSDPA (High-Speed Downlink Packet Access), HSPA, or 3.5G, which is up to five times faster than 3G. Predictably enough, 4G networks are now commonplace, based on technologies called Mobile WiMAX and LTE (Long-Term Evolution). 5G is now rolling out around the world. You can use mobile broadband in two ways. 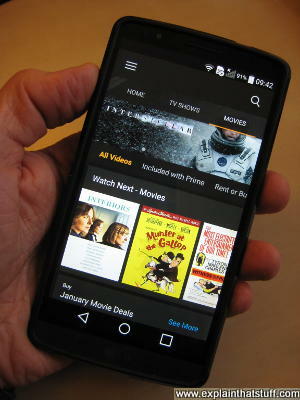 If you have a smartphone (most reasonably, new touchscreen cellphones qualify as smartphones, while older Nokia-style phones with small LCD displays are often called "feature phones" to differentiate them from smartphones), you can download music and videos to your phone at high (broadband) speeds. Unlike with a traditional phone call, where you pay for access by the minute, with mobile broadband you pay by the amount you download. So your mobile phone provider might sell you a certain number of megabytes or gigabytes for a fixed fee. For example, you might pay so much each month and be able to download 1GB, 5GB, or 10GB of data (but there's no restriction on how long you can actually be online, as there used to be with dialup Internet contracts). The other way to use mobile broadband is as a way of getting online with a laptop when you're on the move. You buy a "dongle" (which is a very small, lightweight modem that plugs into the USB socket of your laptop), buy some access time from a service provider, plug your dongle into the laptop, and away you go. The dongle has built-in software so it automatically installs itself on your PC. I was up and running with my mobile broadband in less than five minutes. Think of your dongle as a cross between a modem and a cellphone—but, because it has no battery or screen, it's a fraction of the weight of a cellphone and somewhat smaller. The smallest dongles are slightly bigger than USB flash memory sticks and about twice as heavy (the ZTE dongle in our top photo weighs about 21g or 0.7 oz). 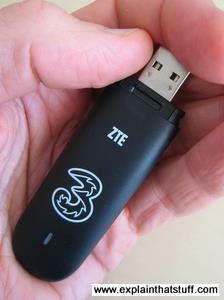 Anywhere you can get a good (3.5G or 4G) signal, your dongle will pick up high-speed mobile broadband. Where there is no 3.5G or 4G network coverage, your broadband will work at 3G speeds (less than about 300kbps). Depending on which country you're in and where you live and work, you may find mobile broadband has much better overall coverage than Wi-Fi—in other words, you can go online in far more places—and it can work out far cheaper too. But it will generally be a lot slower than Wi-Fi unless you can consistently get a 4G signal. Photo: Smartphones have built-in connections to the cellphone network and Wi-Fi, so they can seamlessly switch between the two kinds of mobile broadband depending on where you are and what kind of connectivity they can find. But what if you want to use a laptop when you're on the move and far from Wi-Fi? You could use one of these things: effectively, an adapter that allows a laptop to hook up to a cellphone network. Technically, it's an HSDPA broadband wireless modem—but the phone companies call them "dongles". The dongle simply plugs into your laptop's USB socket and has its own software built in, so it's truly plug-and-play. The one on the left is made by ZTE, the one on the right by Huawei. How will mobile broadband develop in future? Cellphone companies are very excited about mobile broadband—and for good reason: mobile wireless broadband users are growing much faster than fixed (landline) broadband users. Worldwide, more people are now using mobile broadband than landline broadband. Over the next decade, talk will turn increasingly to 5G, which will offer another 10-fold increase in speed, cheaper bandwidth, greater reliability, and lower latency (faster connections), making it possible for many more people (and things) to be online at the same time. I say "things," because one major goal of 5G is to allow more "inanimate objects" to be connected online. This will help to power the so-called Internet of Things, connecting everything from smart-home central heating systems and instantly trackable parcels to the world's increasingly interlinked computer systems. Another goal of 5G is to achieve greater integration with wired, landline networks: at some point, the distinction between "wired" and "wireless" is likely to disappear altogether as they converge and merge into a single, hybrid telecommunications network—part wired, part wireless—that can accessed anyhow, anytime, anywhere by anyone or anything. Chart: Over the last two decades, the world has seen a steady shift away from wired landline telephones toward cellphones and mobile broadband. In 2008, mobile broadband overtook conventional, landline broadband as the most popular form of Internet access—and it's been growing rapidly ever since, largely because cellphones are much more popular in developing countries than landlines. Much of the world now has at least some Internet access, but there remain key "digital divides" between different countries, genders, and age groups. 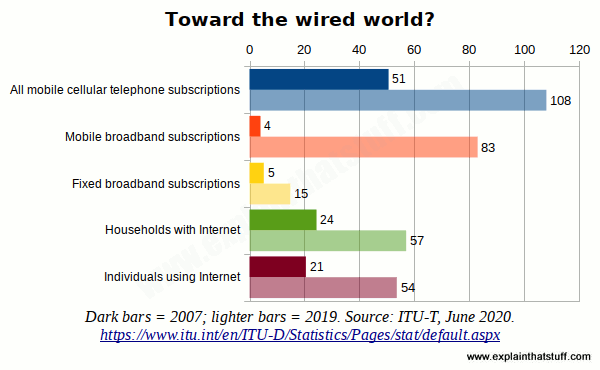 Source: Drawn by explainthatstuff.com using data from "15 years of ICT growth: what has been achieved?," ITU: World Telecommunication Union: Facts and Figures 2015, Geneva, May 2015. If that's all you want to know about mobile broadband, you can safely stop reading now. The rest of this article is for those of you who want a slightly more technical explanation of HSDPA (3.5G), LTE (4G), and 5G networks. First, it helps if we understand a little bit about the mobile cellphone systems that preceded it and how they've evolved from one another. Imagine you want to make lots of money by setting up a telephone company in your area. Back in the 1950s, you would have had to run separate telephone lines to the homes of all your customers. In effect, you would have given each customer a separate electrical circuit that they could use to connect to any other customer via some central switching equipment, known as the exchange. Phone calls made this way were entirely analog: the sound of people's voices was converted into fluctuating electrical signals that traveled up and down their phone lines. By the 1970s, mobile telephone technology was moving on apace. You could now give your customers cellphones they could use while they were on the move. Instead of giving each person a wired phone, what you gave them was effectively a radio handset that could transmit or receive by sending calls as radio waves of a certain frequency. Now if everyone uses the same frequency band, you can hear other people's calls—indeed, the calls get all jumbled up together. So, in practice, you divide the frequency band available into little segments and let each person send and receive on a slightly different frequency. This system is called frequency-division multiple access (FDMA) and it's how the early analog cellphones worked (cordless landline telephones still work this way). FDMA simply means lots of people use the cellphone system at once by sending their calls with radio waves of slightly different frequency. FDMA was like a radio version of the ordinary landline phone system and, crucially, it was still analog. FDMA cellphones were sometimes called first-generation (1G) mobile phones. 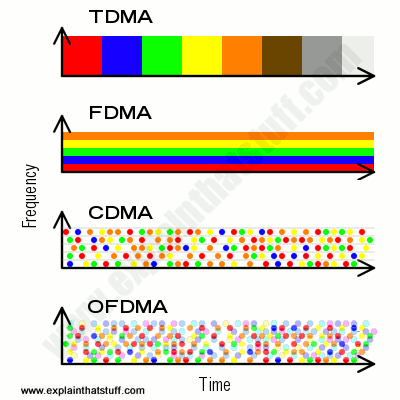 The trouble with FDMA is that frequencies are limited. As millions of people sought the convenience of mobile phones ("phones to go"), the frequency band was soon used up—and the engineers had to find a new system. First, they swapped from analog to digital technology: phone calls were transmitted by sampling the sound of people's voices and turning each little segment into a numeric code. As well as sharing phone calls between different frequency bands, the engineers came up with the idea of giving each phone user a short "time share" of the band. Effectively, the mobile phone system splits up everyone's calls into little digital chunks and sends each chunk at a slightly different time down the same frequency channel. It's a bit like lots of people being in a crowded room together and taking it in turns to talk so they don't drown one another out. This system is called time-division multiple access (TDMA) and it's a big advance on FDMA. GSM cellphones, based on TDMA, were the second generation (2G) of mobile phones. Even TDMA isn't perfect. With the number of phone users increasing so fast, the frequency bands were still getting overcrowded. So the engineers put their thinking caps on again and found yet another way to squeeze more users into the system. The idea they came up with next was called code-division multiple access (CDMA) and uses elements of both TDMA and FDMA so a number of different callers can use the same radio frequencies at the same time. CDMA works by splitting calls up into pieces, giving each piece a code that identifies where it's going from and to. It's effectively a packet-switching technology similar to the way information travels across the Internet and it can increase the overall capacity of the phone system by 10–20 percent over TDMA. Basic CDMA evolved into an even higher-capacity system called Wideband CDMA (WCDMA), which sends data packets over a wide band of radio frequencies so they travel with less interference, and more quickly and efficiently (an approach known as spread-spectrum). 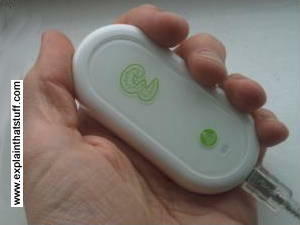 WCDMA is an example of a third generation (3G) cellphone system. The 3G equivalent of GSM is known as UMTS. Ordinary CDMA is great for sending phone calls, which involve two-way communication. But it's not so good for providing Internet access. Although Net access is also two-way (because your computer is constantly requesting Web pages from servers and getting things back in return), it's not a symmetrical form of communication: you typically download many times more information than you upload. Fast home broadband connections achieve their high speeds by splitting your phone line into separate voice and data channels and allocating more data channels to downloading than to uploading. That's why broadband is technically called ADSL: the A stands for asymmetric (and DSL means digital subscriber line)—and the "asymmetry" is simply the fact that you do more downloading than uploading. Think of HSDPA as a kind of broadband, cellular ADSL. It's a variation of CDMA that is designed for downloading—for sending lots of data to broadband cellphones or laptops attached with mobile broadband modems. It's optimized in various different ways. First, like ADSL, it introduces a high-speed downloading channel called HS-DSCH (High Speed Downlink Shared Channel), which allows lots of users to download data efficiently at once. Three other important features of HSDPA are AMC (adaptive modulation and coding), fast base-station scheduling (BTS), and fast retransmissions with incremental redundancy. What does all that stuff actually mean? AMC (Adaptive modulation and coding) simply means that the cellphone system figures out how good your connection is and changes the way it sends you data if you have a good connection. So if you're in the middle of a cell (near a cellphone antenna base station), you'll get more data more quickly than if you're at the edge of a cell where reception is poor. Fast base-station scheduling means that the base station figures out when and how users should be sent data, so the ones with better connections get packets more often. In any packet-switching system, packets sometimes get lost in transmission, just as letters get lost in the regular mail. When this happens, the packets have to be retransmitted—and that can take time. With ordinary CDMA technologies, retransmissions have to be authorized by a top-level controller called the radio network control (RNC). But with HSDPA, fast retransmissions are organized by a system closer to the end user, so they happen more quickly and the overall system is speeded up. Incremental redundancy means the system doesn't waste time retransmitting bits of data that successfully got through first time. Put all this together and you have a cellphone system that's optimized for sending out packets of data to many users at once—and especially those with good connections to the network. Because it's better than 3G, they call it 3.5G. It took about 40 years for cellphones to get from basic analog, voice conversations up to 3.5G and 4G mobile broadband. Broadly, 4G is something like 10–50 times faster than 3G (depending which way the wind is blowing and whose figures you choose to believe). What makes 4G better than 3.5G and 3G? Although there are numerous differences, one of the most significant is that CDMA (the way of getting many signals to share frequencies by coding them) is replaced by a more efficient technology called orthogonal frequency-division multiple access (OFDMA), which makes even better use of the frequency spectrum. Effectively, we can think of OFDMA as an evolution of the three older technologies, TDMA, FDMA, and CDMA. With traditional FDMA, the available frequency spectrum is divided up into parallel channels that can carry separate calls, but there still has to be some separation between them to stop them overlapping and interfering, and that means the overall band is used inefficiently. With OFDMA, signals are digitally coded, chopped into bits, and sent on separate subchannels at different frequencies. The coding is done in such a way that different signals are orthogonal (math-speak meaning they are made "independent" and "unrelated" to one another), so they can be overlapped much more without causing interference, giving better use of the spectrum (a considerable saving of bandwidth) and higher data speeds. OFDMA is an example of multiplexing, where multiple, different frequency bands are used to send data instead of one single frequency band. The big advantage of this is that there's less signal disruption from interference (where selected frequencies might be destroyed by transmissions from other sources) and fading (where signals gradually lose strength as they travel); lost data can be reassembled by various error-correction techniques. At least, I think that's how it works—I'm still figuring it out myself! Of course, it doesn't stop there. Cynics would say that cellphone manufacturers need us to update to a new model each year, while the cellphone networks want us to send more and more data; both are helped by the shift to newer, better, and faster mobile networks. But, overwhelmingly, the main driver for 5G is that so many more people—and things—want to connect wirelessly to the Internet. As we've already seen, 5G is meant to be faster, more reliable, higher capacity, and lower latency than 3G and 4G, which already use their very congested part of the frequency spectrum very efficiently. So how do you possibly get even more out of a limited band of radio waves? One solution is to switch to a completely different, less-used frequency band. Where existing 4G cellphone networks use radio waves that have frequencies of roughly 2GHz and wavelengths of about 15cm (6in), 5G could switch to much higher frequencies (between 30–300GHz) and shorter wavelengths (a millimeter or less). These so-called "millimeter-waves" are currently used by things like radar and military communication, so there's much less congestion than in the current frequency band. But the drawback is that these waves don't travel so far or so well through objects like walls, so we might need more mobile antennas, mobile antennas inside our buildings, more cells in our cellphone networks, completely different antennas in our smartphones, and a range of other improvements. The switch to higher frequencies is one aspect of 5G; the other aspect would be the development of improved technologies building on existing approaches such as HSDPA and LTE. For the moment, details of exactly how 5G will work are still vague and very much under discussion; I'll be adding more information here as it becomes available. Here's a hugely simplified attempt to represent, visually and conceptually, the four key wireless technologies. I emphasize that it is a considerable simplification; if you want a proper, technical account, you'll find a selection of books and papers in the references at the end. It's worth remembering that "4G" is being used—like 3G and 3.5G before it—as a marketing term. Some systems you see advertised as "4G" are really just glorified 3G or 3.5G systems that don't meet the technical (international standard) definition of 4G, which is formally known as International Mobile Telecommunications-Advanced (IMT-Advanced). Now you might or might not care about international standards, but it's always worth questioning whether the sales people are delivering what they claim as they part you from your cash. Internet: How does computer data travel over the Net? World Wide Web: What's all this HTTP and HTML stuff and how does it work? Wireless Internet: Including Wi-Fi and WAP. Broadband over power lines: How to get broadband to (and around) your home using a system of adapters plugged into your normal electricity outlets. Why the U.S. Has Fallen Behind in Internet Speed and Affordability by Claire Cain Miller. The New York Times. October 30, 2014. Why do Americans pay more for high-speed Internet access? The Shadow Internet That's 100 Times Faster Than Google Fiber by Klint Finley. Wired, June 17, 2004. The secrets of the super-fast ESnet. Lighting a Fire Under Satellite Broadband by Kim Krieger. IEEE Spectrum. February 17, 2012. Surprisingly, fast ground networks are the key to fast satellite broadband. 5G will let users ditch fixed-line home broadband, says Three by Leo Kelion. BBC News, November 7, 2018. Is the promise of 5G anything more than hype? What 5G Engineers Can Learn from Radio Interference's Troubled Past by Mitchell Lazarus. IEEE Spectrum, June 9, 2016. What techniques will congested 5G networks use to avoid interference between users? 5G Is a New Frontier for Mobile Carriers and Tech Companies by Mark Scott. The New York Times, February 24, 2016. How academics and telecomms companies are competing to be at the forefront of 5G. What 5G Will Mean for You by Mark Scott. The New York Times, February 21, 2016. A short summary of the likely benefits we'll enjoy once 5G becomes commonplace. Wired Explains: Everything You Need to Know About 4G Wireless by Priya Ganapati. June 4, 2010. A good, simple backgrounder on 4G written as a FAQ. Short on technical detail, but it does explain the key differences between 3G, 3.5G, and 4G and includes a comparison of LTE and WiMAX. The Beginner's Guide to Broadband and Wireless Internet by Peter Burns. Summersdale, 2005. A simple guide that also covers things like choosing your modem/router and how to install decent antivirus software. Broadband Telecommunications Handbook by Regis Bates. McGraw-Hill, 2002. A more technical introduction to wired and wireless broadband. Broadband Circuits for Optical Fiber Communication by Eduard Säckinger. Wiley, 2005. A graduate-level technical introduction to fiber-optic broadband hardware. Data Communications Principles by Richard D. Gitlin, Jeremiah Hayes, and Stephen B. Weinstein. Springer, 1992. A dated but still valuable introduction to the basic concepts from the co-inventor of DSL. I've yet to discover a good, simple book explaining cellphone network technologies for general readers; please be aware that these books are very detailed technical explanations aimed at advanced-level students or industry professionals, often containing quite complex math. 4G, LTE-Advanced Pro and The Road to 5G by Erik Dahlman et al. Academic Press, 2016. A detailed (600+ page), technical explanation of the latest technologies and trends in mobile, cellphone Internet access. Mobile Broadband (Including WiMAX and LTE) by Mustafa Ergen. Springer, 2009. An introduction to the next generation of mobile broadband, based on OFDMA technology (not discussed in this article). LTE for UMTS—OFDMA and SC-FDMA Based Radio Access by Harri Holma and Antti Toskala. John Wiley & Sons, 2009. A detailed look at LTE and 4G technologies. CDMA Technologies by Hsiao-Hwa Chen. John Wiley & Sons, 2007. A comparison of different CDMA technologies, covering 2G, 3G, and 4G. OFDM for Wireless Communications Systems by Ramjee Prasad. Artech House, 2004. One of the clearest of the technical books. US Patent 4,330,687: Audio and full duplex digital data carrier system by John D. Foulkes et al, Teltone Corporation, May 18, 1982. US Patent 4,330,687: Simultaneous transmission of voice and data signals over a digital channel by Stephen J. Brolin et al, AT&T Bell Laboratories, October 9, 1984. US Patent 4,258,433: Digital data communication network having differing data transmission rate capabilities by Ludwik Herschtal et al, L M Ericsson Pty. Ltd., March 24, 1981. US Patent 4,924,492: Method and apparatus for wideband transmission of digital signals between, for example, a telephone central office and customer premises by Richard D. Gitlin et al, AT&T, May 8, 1990. US Patent 5,214,650: Simultaneous voice and data system using the existing two-wire interface by Robert E. Renner, Ag Communication Systems Corporation, May 25, 1993. US Patent 5,812,786: Variable rate and variable mode transmission system by John W. Seazholtz et al, Bell Atlantic, September 22, 1998. US Patent 3,488,445: Orthogonal frequency multiplex data transmission system by Robert W. Chang, Bell Labs. January 6, 1970. I believe this is the earliest patent covering modern OFDM, though (according to Ramjee Prasad's book, section 1.2.1 "History of OFDM", p11) development of the technology can be traced back to the 1950s and 1960s. US Patent 4,301,530: Orthogonal spread spectrum time division multiple accessing mobile subscriber access system by Frank S. Gutleber, US Army. November 17, 1981. A slightly later patent developed for use by the US military. US Patent 2,292,387: Secret communication system by Hedy Kiesler Markey (Hedy Lemarr) and George Antheil. August 11, 1942. Hedy Lemarr and George Antheil's groundbreaking spread-spectrum patent (originally proposed for torpedo control). The World in 2015: ICT Facts and Figures, International Telecommunications Union, 2014. This recent report has lots of up-to-date statistics about global Internet use, with a particular focus on the huge growth in mobile broadband in developing countries. World Telecommunication/ICT Development Report 2010: Monitoring the WSIS Targets: This older report focuses on the challenges of getting developing countries connected to the Internet, especially in remote areas.